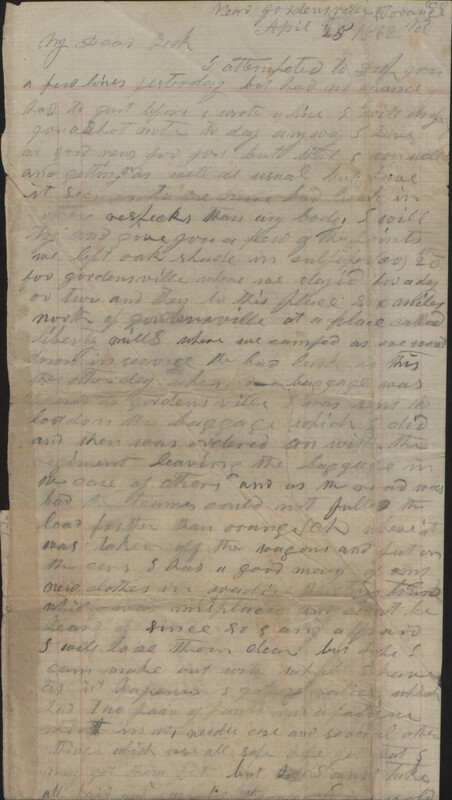 Item description: Letter, dated 25 April 1862, from Robert W. Parker (2nd Virginia Cavalry of the Confederate States of America Army), near Gordonsville, Va., to his wife, Rebecca Louise Fitzhugh Walker Parker. Item citation: From volume 2 in the Robert W. Parker Papers, Southern Historical Collection, The Wilson Library, University of North Carolina at Chapel Hill. I attempted to drop you a few lines yesterday but had no chance had to quit before I wrote a line I will drop you a short note to day any way I have no good news for you but that I am well and getting on as well as usual but have it seems to me more bad luck in other respects than any body. I will try and give you a few of the points we left oak shade in culpeper (co) th 20 for gordensville where we stayid for a day or two and then to this place six miles north of gordensville at a place called liberty mills where we camped as we went down in [servize] the bad luck is this the other day when our baggage was asined to gordens ville I was sent to load on the baggage which I did and then was ordered on with the regiment leaving the baggage in the care of others and as the road was bad the teams could not pull the load farther than orange (ch) where it was taken off the wagons and put on the cars I had a good many of my new clothes in wadie Burtons [townd] which was misplaced and cant be heard of since so I am a fraid I will lose them clear but hope I can make out with what I have as it hapened I got my valie which had two pairs of pants and a fatigue shirt in it, needle case and several other things which were all safe hope yet that I may get them yet but I must take all fair and say for but fear my chance is a bad one wish I could get some one to take my place til I could see you between the ages of 18 & 35 in service so they have not past any way I am a poor unlucy being in some respects. I have not enlisted yet But think of course I am in for the war I will try and be content and do my duty as a souldier for my beloved country my greatest wish and anxiety is to se my loved little family the theme of my earthly thoughts. 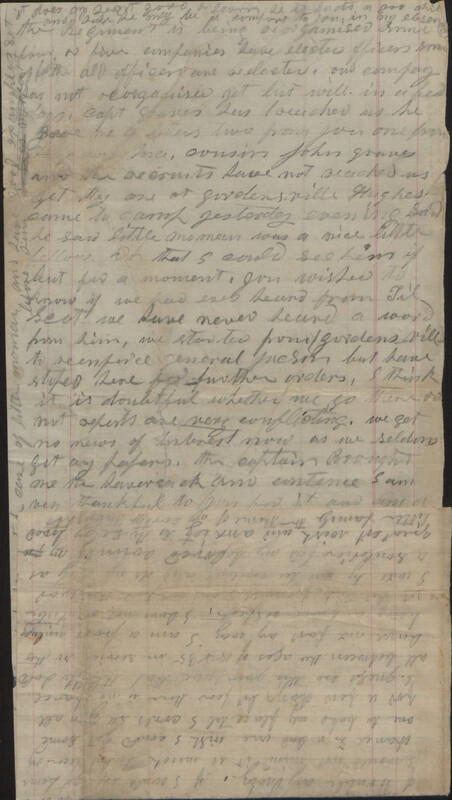 This entry was posted in Southern Historical Collection and tagged 2nd Virginia Cavalry, Robert W. Parker. Bookmark the permalink.